Dr Marie Stopes sought to settle her libel suit against Dr Halliday Sutherland out of court, according to a 1939 newspaper report. The article: “Echoes of Famous Law Case, A.R.P. at Sea, and Finland” appeared in The Southern Cross on Friday, October 20th 1939 and reported Dr Sutherland’s speech to the Catholic Men’s Luncheon Club the previous week. The lunch occurred during Dr Sutherland’s Australian tour in 1939-40. Sir Charles Russell was Sutherland’s solicitor (ie. the defendant’s legal advisor, not the plaintiff’s as stated in the article). 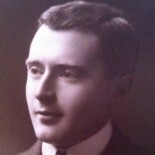 Mr Percy Braby was the solicitor to the plaintiff. It would be interesting to know at what point the offer of settlement was made, what the proposed apology looked like, why Stopes was prepared to pay Sutherland’s costs. Unfortunately this was not disclosed. The article, which is part of the National Library of Australia’s excellent Trove collection, can be viewed here. This entry was posted on 1 February 2019 by markhsutherland in Australia, Australian tour, 1939, Stopes v Sutherland.